Long-standing rock pub opposite Camden Town tube station. Below the pub there's a music venue called Underworld photo. The pub itself has two bars. secretlondon visited one Friday in August 2015. 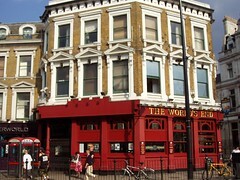 The beer selection included their own World's End Ale (Shepherd Neame) and World's End Pilsner. A pint was between £4 and £5. The consensus of our group was that the beer wasn't very good. They also sell food although I didn't try any. Accessibility: The ladies' toilets are down a small flight of stairs, but there may be an accessible toilet on the level. It was very crowded and I think you would struggle to get through if you were using a wheelchair. There was loud rock music. Last visited by secretlondon, August 2015. Last edited 2015-08-16 11:59:36 (version 5; diff). List all versions. Page last edited 2015-08-16 11:59:36 (version 5).